Sent to Taupo District Council 47 sec later. The wall under our canopy has been tagged. 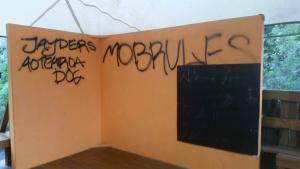 It says "Jayders Aoteroa Dog" on one part of the wall and "Mobrules" on the other.